After another short stint on the sidelines, the derby stage is set for a big Tex Walker return. Melbourne might be the epicenter of footy, but when the Sherrin shifts to the South Australian derby, Adelaide steals the show. It’s by far one of the premier rivalries in the AFL, one that always brings out the best in the fans and dollar value for punters. With the Crows winning the last five games straight, you could say the derby hasn’t really lived up to the hype recently, but alas, this year’s showdown on Saturday afternoon is must watch telly. One quick look at the ladder, and the plot only thickens. Here’s the Crows sitting pretty in third, while Port’s bubble looks close to burst following a Round 7 thumping at the hands of West Coast. Bookies aren’t loving the Power’s form of late either – Port are way out to $2.44 on the back of a 42 point loss, while the Crows hold some value at $1.55. With three straight losses in hand, some might say those odds are a little askew. After piling on a whopping 230 combined points in both derby victories last season, it’s somewhat surprising not to see Adelaide closer to the $1.10 mark. On the flip side, though, this 2018 version of the Crows looks a little untrustworthy. The taste of a 48-point defeat at home to Collingwood a month ago is still sour for some fans, and although last week’s win against Carlton looks convincing on the scoreboard, there was a point in the second quarter where the Blues made things interesting. 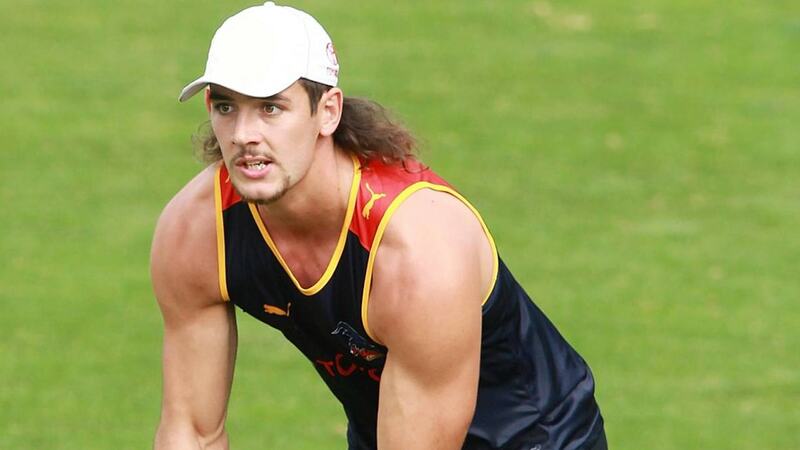 So with all that in mind, why should you back the Crows? He’s missed two separate weeks with hamstring aggravation, but would you believe Tex has still managed 15 goals? That’s good for the eighth most in the competition, and he’s booting them at a clip of three per game. You don’t have to scroll down very far to marvel in Tex’s derby brilliance, either – he torched Port Adelaide for four goals in Round 3 last season, and three goals and 23 disposals in Round 20. What’s great about Tex, just like in other years, is his accuracy. Last season he took the seventh most set shots at goal of any player, and also held possession of 76% of the balls kicked to him inside 50. 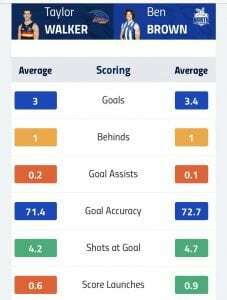 This year all of that forward pocket success has translated into a 71% accuracy rate in front of the sticks, which for comparisons sake, is only two spots lower than North Melbourne’s Ben Brown. If there’s one knock on Walker so far this year, it’s his contested marks. After such a successful season in and around the goal square last year, Walker has taken only eight contested marks through the first seven rounds. If there was ever a more fitting opponent to help him get his season back on track, though, it would have to be the Power. Port are currently allowing 83.4 points against this season, all on the back of a four goal drubbing against West Coast’s Josh Kennedy last week. Part of Adelaide’s push towards September last year was in large part thanks to Walker’s defensive pressure. He finished with a 19% turnover rate to his name, making him one of the most dangerous forwards without the ball in his hands. What’s interesting here is the heat map comparison between Walker’s Round 3 and Round 20 games, because as you’ll see, the Crows utilised him in several different ways. Those maps show Walker received the majority of his possession just inside the 50 towards the right hand side of goals. So what? That’s nothing out of the ordinary. But what’s interesting is Walker’s forward/back half splits. In Round 3 he spent 88% of his time up forward, while in Round 20 that number drastically decreased down to 68%. What this shows is the Crows conversion from a more attack-minded approach in the early stages of last year, to a more sound defensive structure as the season drew on. Ironically, Walker actually put up similar stats in Round 20 to those he tallied in Round 3, even though he spent more time defending. Ultimately though, his 23 disposals in the second derby clash is what the Crows would like to see from their star player again this weekend. The derby always has big ladder implications, but this year it just feels different. The Tigers are running away with the comp, while the Crows now have to fend off Hawthorn if they wish to keep pace with the Top 3. Port Adelaide meanwhile have fallen from $5.00 to win the flag all the way to $10.00, and if Tex kicks a bag this weekend, it might lights out for the Power as far as finals go.